NEW DELHI: Delhi government still has a long way to go in clarifying the policy before private individuals take the decision to set up rooftop solar systems. The net metering scheme that was announced by the Delhi Electricity Regulatory Commission (DERC) on Tuesday is only a nascent step in this direction. The most important issue is the financial incentive that will push residents to invest in solar rooftop systems. Other problems are resolving technical issues like uneven height of houses, specifications for orientation of the roof, how much roof space is required, how will these systems be maintained, among others. "We are glad to know that net meters can be installed and we are open to setting up such systems. But the question is what is in it for us? First the government will have to clarify how much subsidy and what financial incentive will be given to individuals. It must also check whether it is feasible to do these on small rooftops of less than 200 sq yards," said Atul Goel, convenor of United Residents Joint Action of Delhi who had some meetings with Greenpeace, an environmental NGO studying whether Delhi can implement solar rooftop systems on a large scale. As of now, projects in Delhi only get a 30% subsidy from the ministry of new and renewable energy (MNRE). "It's a welcome move that DERC has finally come up with a net metering policy. But how can people use it without a comprehensive solar policy which will specify financial incentive in detail? Only if the incentive is attractive that people would think about it. 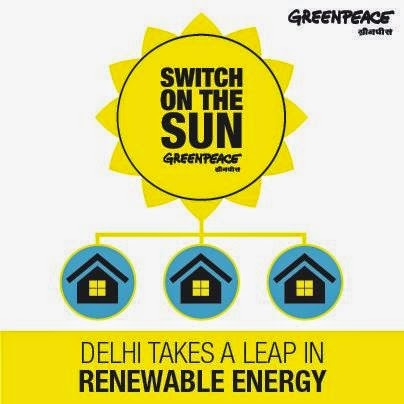 As of now, a few individuals in Delhi have set up rooftop solar panels to meet their back-up needs because diesel generators cost a lot," said Abhishek Pratap, energy campaigner at Greenpeace India. The few who have already installed solar panel systems may, however, stand to benefit immediately from the net metering scheme. Anand Prabhu Pathanjali, who recently conducted a study on Delhi's solar potential, said, "There are very few residences that have set up such systems. Now they can definitely benefit from the net metering scheme. This will also get more people to set up the system in their houses." There are a few houses in South Extension and Safdarjung Enclave, apart from a few others in West Delhi that have installed solar panels of less than 5kW. The German House of Research and Innovation and WHO building also have panels with over 10 kilowatt peak (kWp) capacity that can benefit from net metering. The Energy and Resources Institute (TERI) is planning to install a system of less than 100 kWp on their office building. "We don't have much space so we are exploring what can be done. However, we'll probably not generate enough to have more power than our requirements. On weekends we can supply entirely to the grid," said Amit Kumar, adjunct professor, TERI University.